Extreme sports are based on the belief that the boundaries can always be pushed. Bigger air, bigger trips, bigger tricks. It may take a decade to accomplish it, but a feat will rarely go unconquered. State College's Jamie Bestwick continues to push his own boundaries, winning a ninth straight X-Game gold late Thursday night to extend his reign of BXM dominance. "When I broke the record last year, that was stressful," Bestwick, told ESPN. Bestwick set the X-Games mark for the most consecutive wins last year with his eighth victory in a row at X-Games Barcelona. "I really wanted that record. Everything after that is just seeing how long it can hold up." Bestwick won his ninth straight gold thanks in large part to opening two runs of a best score of 92.66 on his first of two runs held up. By the time his third and final run came he had the medal locked up, leaving him to take a victory lap in front of the estimated 12,000 fans in downtown Austin. After winning his first X-Games medal in 1996, Bestwick now has 13 career X Games golds. At age 42, he was the second-oldest rider in the BMX Vert field behind Dennis McCoy, 47, who landed a 900 on Thursday night, becoming the oldest person to land the trick. So if you see Bestwick walking -- or riding-- around State College in the coming weeks tell him congratulations, but don't tell him he can't do something. Because he will probably prove you wrong. Pittsburgh Police Commander Scott Schubert left Pittsburgh on foot on Monday morning. 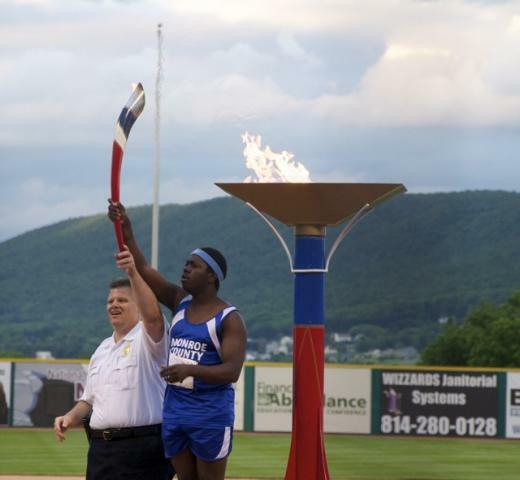 Some 150 miles later, and with the help of over 400 other law enforcement officers from across Pennsylvania, he reached State College with the Special Olympics ‘flame of hope’ torch.